The hotel is located at the tip of the Pelican Key peninsula, right on the beach, offering guests a prime view of the sparkling sea in Simpson Bay. Marigot and Philipsburg are both about a 20-30 minute drive away. This resort hotel is ideal for an exotic island holiday in a beachside setting. It offers villas and studios and has 240 rooms in total. It is air-conditioned and offers facilities to benefit both children and adults. Younger guests are sure to enjoy the pool and beach area. All units are beautifully decorated and furnished and come equipped with all the necessary commodities. Guests may take advantage of the outdoor pool with poolside snack bar. Additionally, there is a variety of land and water-based activities available at the hotel. An entertainment and activity programme for children also features. 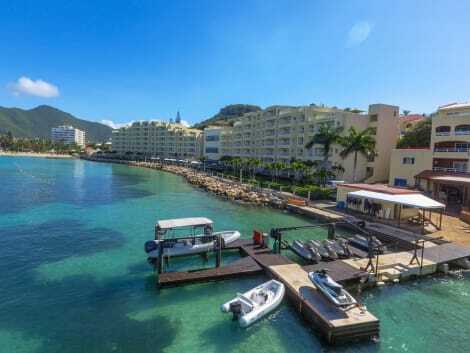 Sitting on the tip of the peninsula, this hotel offers a prime view of the sparkle of the sea in Simpson Bay and places its guests right on the beach. The location is perfect for water sports practitioners and everyone who enjoys the sun, the sand and the sea. The range of possibilities for the former include water skiing, jet skiing, diving, surfing, windsurfing and many others. In case they want something a little more ground based they can either hire a bicycle and explore the area or try horse riding. The guests who want to relax can stretch on the sun loungers around the outdoor swimming pool and sip a cocktail from the poolside snack bar. They can also pamper themselves with a massage or any of the large variety of spa treatments. When it comes for dining one will be spoiled with choice between the several restaurants of the complex. Grab a bite to eat at TIDES Restaurant & Bar, a beachfront restaurant which features a bar. Breakfast is available for a fee. lastminute.com has a fantastic range of hotels in Simpson Bay, with everything from cheap hotels to luxurious five star accommodation available. We like to live up to our last minute name so remember you can book any one of our excellent Simpson Bay hotels up until midnight and stay the same night.